While driving back from a recent trip to Montreal, we stopped for lunch at Park Row Cafe in Waterbury, VT. This place served amazing sandwiches on home made bread, hot sandwich specials, and homemade soup. Price got a cup of their cheddar broccoli soup to go with this 1/2 a BLT. I had never had cheddar broccoli soup before. Why? Because I hate the smell of steamed broccoli. Any time I hear of broccoli as a side dish I think of overcooked cafeteria broccoli. But I tried and anyway and I LOVED IT. It was creamy, thick, cheesy, hearty, and the broccoli was not a stinky mess. So I had to have this soup again. However the drive to Waterbury VT from Boston is not every convenient so I had to create a homemade version that would satisfy my craving. But, to make this soup more figure friendly I made it in the lightest way that I could, without having it watered down or using some (gross) non-fat cheese. 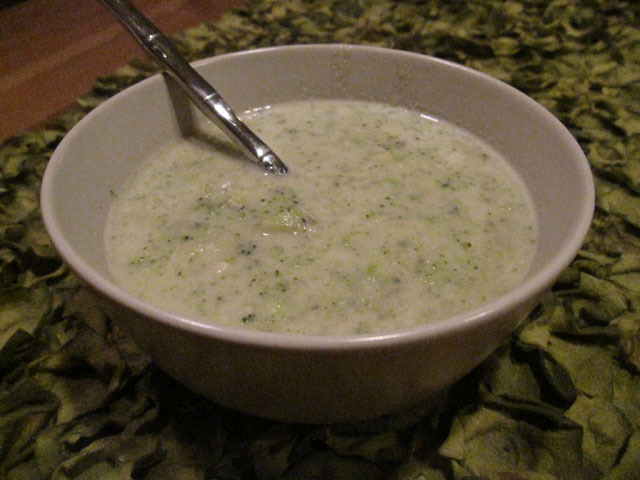 Since this soup is on the lighter side I felt it was best to cook the broccoli in the milk, compared to just added steamed broccoli to the soup. Why? I did not want to loose any flavor, or nutrients, in the discarded water used for steaming. 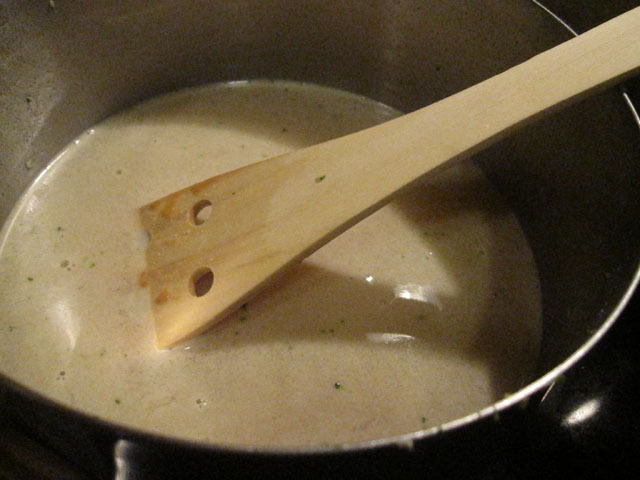 While I have found that blending a light soup is the easiest way to make it “richer”, I decided not to do that since I wanted to have a bit more texture to the soup, but there is no restriction about blending the soup. 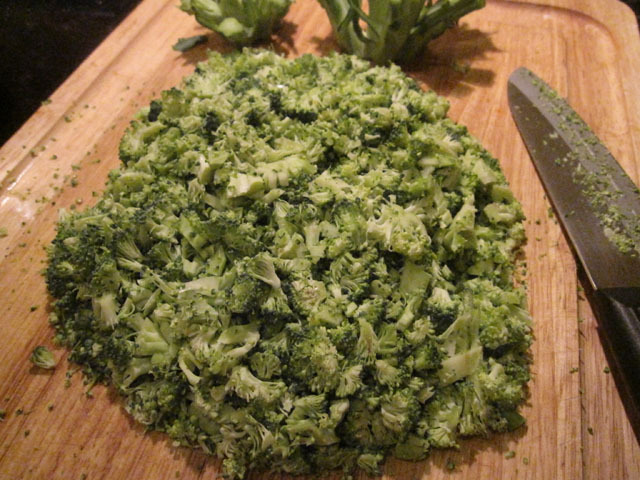 Finely chop 2 heads of broccoli, including steams. 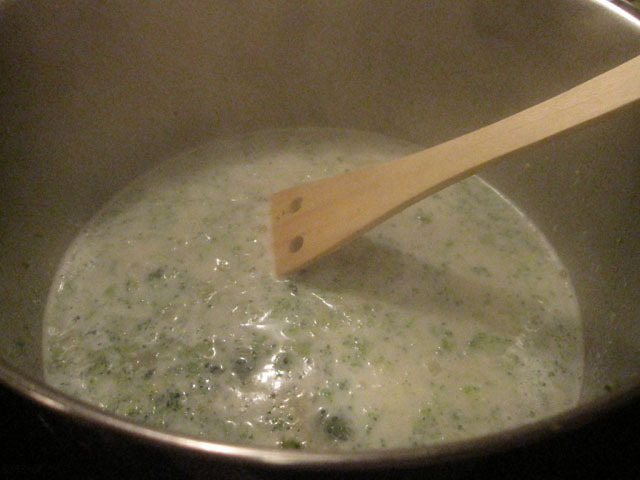 In a large pot, combine the milk broccoli and simmer until broccoli is tender. 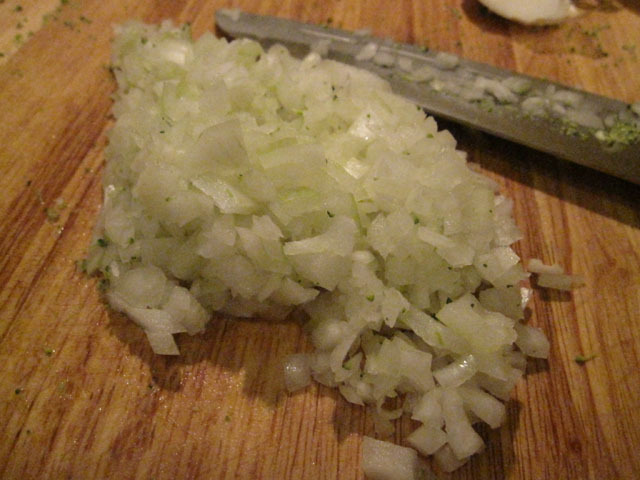 In a small pot, saute the onions with 2 tablespoons butter. 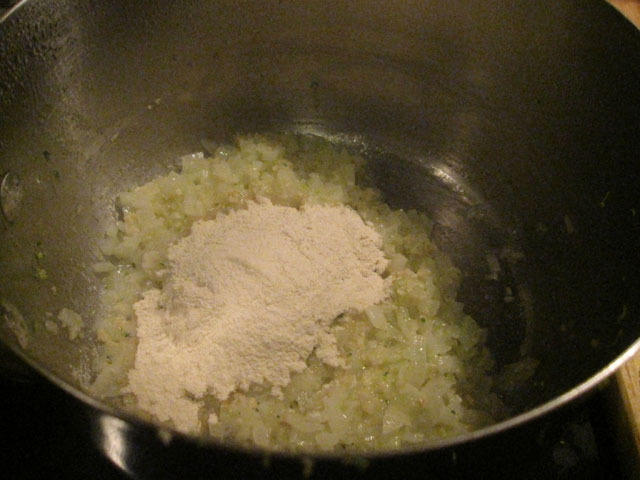 Once the onions are translucent, sprinkle the flour in and mix with a wooden spoon until the flour has evenly covered the onions. Add the broth slowly and mix until all lumps of flour are broken down. 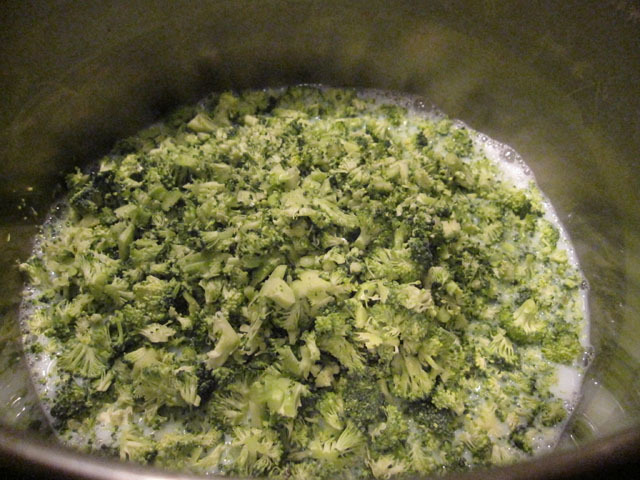 Add the broth mixture into the large pot. 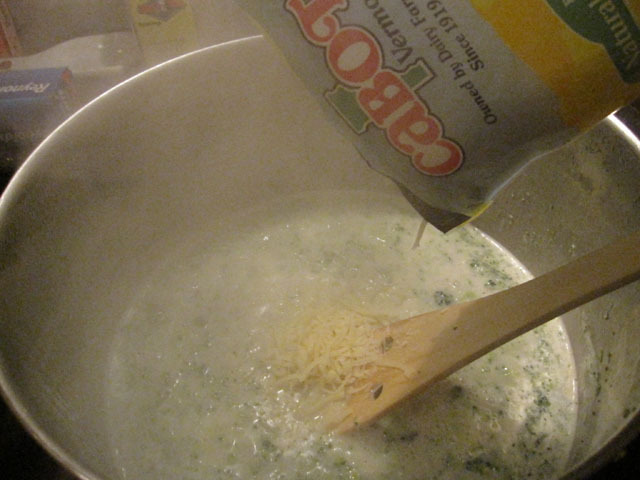 Lastly, add in the cheese and mix until the cheese is melted and completely incorporated. Serve immediately. 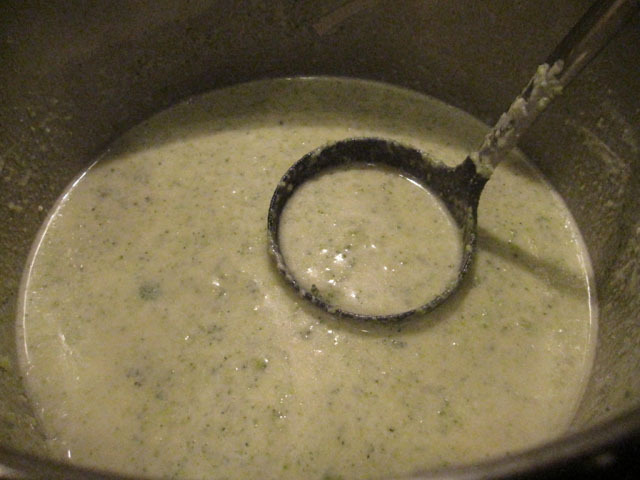 This broccoli soup recipe sounds great. I like how you decided to cook the broccoli in the milk and keep all the nutrients in there. This recipe sounds wonderful! I can’t wait to try it. I love the little sneak peek of our Cabot packaging in the corner of the one picture! This would make a great meal for a cold night. Thanks for keeping it in the Vermont Family! ooo, looks delicious! i want to try it in a bread bowl-yum yum. Yeah…may have to try this REALLY soon. Looks great! Okay you got me in on this one. I love this soup and have wanted a lighter version. Thanks!! !